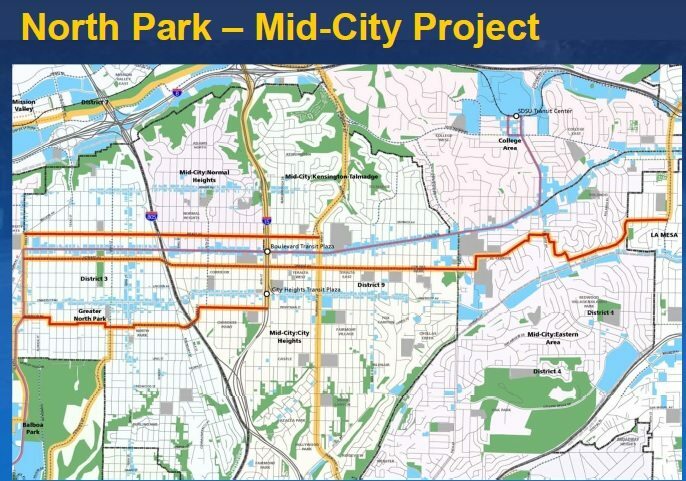 The North Park – Mid-City Project Has More Bike Lanes – Commercial Routes or Residential Streets? After small group discussions each group presented a summary to all present. These three routes are the “Preliminary Project Corridors” and were selected from the Riding to 2050 – San Diego Regional Bike Plan report. (Page 31 of this report highlights these three routes.) At both meetings maps were presented with these three “Preliminary Project Corridors” highlighted in red. Although discussions have included alternative routes, these three have been most prominent – visually as well as the center for discussion at each meeting. I was in a small group discussing the Landis / Wightman corridor that was roughly split between those that favored a residential setting for improving bicycle infrastructure (as Landis / Wightman are) and others that preferring to see improvements on a major commercial route, in this case University Avenue. Other groups had different routes to consider but seemed to favor the major commercial route of El Cajon Boulevard. Within my group, those favoring Landis appeared to be interested in both bicycling infrastructure, as well as improving other elements of the street such as sidewalks, lighting, etc. Since my group was essentially debating the merits of residential versus commercial in regard to specific streets, I will use Landis (residential) and University (commercial) to represent these two options. It is worth noting the Wightman Street in City Heights is a better street for bicycling than Landis Street in North Park – flatter, wider, with less turns in the road, and with some bicycle signage and lanes in place already. When evaluating these two routes using the project goals it is clear that University Avenue more fully achieves the goals. There are essentially zero commercial destinations on Landis. University (as well as El Cajon and Adams Avenue to the north) has coffee shops, restaurants, bicycle shops, and other points of interest in high quantity (Goal 1). University also has frequent bus service from multiple bus lines while Landis has none (Goal 1). Creating complete streets can be accomplished on any route, but University is better suited to do so sooner. Overhead street lighting is prevalent, as are wider sidewalks (with ramps at intersections). There are also many people walking and riding on University already, making it more welcoming for others to join them (Goal 1). Goal 3 is to design innovative features, which can be done on any street. For example, BikeSD is advocating for cycletracks on El Cajon Boulevard which is a great example of safe, innovative infrastructure that should be considered. Innovations can be implemented on any street, so I would call Goal 3 a wash in evaluating the two options. Goal 5 I find most important one, especially supporting place-making. I didn’t know the precise definition previously, although I had heard it many times before and had the general idea. Basically, place-making is bottom-up design, rather than top-down. On this point it is most strongly shown that University is the superior choice. 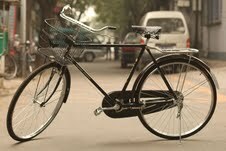 There is wide-spread support for bicycling on University that is apparent to any passersby. Take a walk, ride, or drive down the street and you will see ample evidence of a thriving cycling community already in place. There are many bicycle racks (on Landis, essentially none), and many cyclists already use it to go to and from work, dinner, playgrounds, and other destinations despite the lack of a single block of bicycle lane. The city’s first parklet will also soon debut less than a block from University. Three of the city’s four bicycle corrals are on (or within a block of) University. We have businesses not only asking for bicycle infrastructure but also helping to pay for it. These are signs of wide-spread support and use of bicycles in the area and need to be built upon. Additionally, Transit San Diego recently held a rally and walk to support walkable, bikeable, livable streets which included a visit from Mayor Filner. Where was the walk held? On University Avenue. We don’t have to speculate on what the likely result of a Landis-type bike route would be. We have a real-life, working example in North Park already: Utah Street. This is a flat street, with two full vehicle lanes, as well as two full bicycle lanes, and two full vehicle parking lanes. The result: scarcely a rider in sight. The reason? There are no destinations in a residential neighborhood! Go two short blocks over to 30th Street and you’ll see plenty of bicyclists despite the lack of bicycle lanes and much higher traffic, including buses. Why? Because 30th has places that people actually want to go. If you’re looking for another example further south, take a look at Island Avenue which has a bike lane and again, scarcely a rider to be seen (Island Avenue also has significant elevation changes which likely add to the lack of cyclists there). The “Preliminary Project Corridors” selected implicitly recognize that most people want to be on the major streets. Why else would each one be cited just a block or two from a major commercial route (either University Avenue or El Cajon Boulevard)? The CAG is a group of community and bicycle-group leaders, as well as residents of the communities that are part of this project area. This group needs to stand up for the interests (and rights! and safety!) of bicyclists and not settle for the easy options presented as the default. Who wants to bike down Landis? Who has ever even been on Landis or can place it on a map? Is our best suggestion after spending decades building up (and paying up) for automobile infrastructure to consign bicyclists to little used side streets because there are too many cars on major streets? This simply reinforces the supremacy of the automobile where people actually want to be. Bicyclists are then left to fend for themselves. I hope that the path of least resistance is not taken. Side streets like Landis are easy streets on which to implement infrastructure for bicycles – there is already ample pavement space for bike lanes and light traffic to deal with. It is easier to suggest, easier to implement, and after the public-input meetings it can also be said these routes were selected and implemented with the input of bicyclists and the broader community. At the end of the project SANDAG will be able to trumpet the 20 miles (give or take) of bicycle lanes added. And they will likely be as little used as those on Utah Street, and people looking to go out, hang out, and be out will continue to ride on University, 30th, and other major routes with little or no infrastructure. Most of the small group presentations endorsed focusing on major commercial routes, specifically El Cajon Boulevard. My group appeared to be the most split between the two options, although I was not privy to the full conversations taking place at other tables. The next meeting will present two alignment and cross-section alternatives for each corridor and the discussion will focus on selecting those most favored among the alternatives. If this opportunity is to be capitalized on and contribute to increasing the momentum for a healthier, more livable San Diego, there needs to be strong, widespread support for promoting bicycling and bicyclist safety on our major commercial routes. I hope that the next meeting will see more attendees and more voices speaking up for routes that will provide the most benefit and not settle for the defaults provided. San Diego, with gorgeous weather, an active populace, and much open space won’t be found on the top 10 most bike-friendly cities from CNN. Nor on the top 50 from Bicycling. We can do so much better! San Diego can, and should be the premier bicycling community in the nation and among the top in the world. All it takes is a populace willing to work for healthier, happier, more vibrant lives and to speak up. If you would like to voice your opinion on this project please see the official SANDAG website and attend the next meeting which will be held in May. The exact date has not yet been announced. For additional details on the last meeting check out this page for meeting notes, the presentation, and more. If you can attend the next meeting please do so. Whether you attend or not, please send a message expressing your opinion on the project to project manager Bridget Enderle and/or Senior Active Transportation Planner Chris Kluth. It would seem easier to climb the hills around town with gears, but I also have little fashion sense. What’s the matter, John, you don’t have “fixie zen”? That intangible quality that leads you to declare fixies are better and the rest of us will know why only when we master the backwards technology? I applaud anyone pedaling on two (or three) wheels on our streets, but not until I see the yellow shirt on the Tour worn by a fixie rider will I be convinced. Some folks just can’t figure out them Disraeli Gears. I don’t yet but I’m new to North Park. Maybe in a few months (years?) I’ll be converted. Disraeli Gears – a Cream reference? If it’s a brand of bike part I’m unaware of it. . . Very interesting – thanks for the info. Probably why they put the bike lanes there. They didn’t want them, so they put them on a street nobody drives on anyway. John – I agree and hope this won’t be the outcome of the current planning process. Time will tell. . .